Knowing how to build a professional website for your business plans and ventures is the beginning of your online presence. It simultaneously operates as your communication channel, branding tool, and a store platform. Your customers expect the best even before setting foot in your shop, and your website is a clear representation of your professionalism. 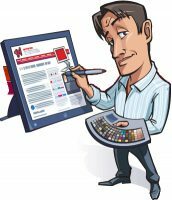 Are Website Builders the answer to building a professional website? Yes, there are quite a few cost effective, builders that build beautiful websites for most basic needs. A website churned out by a builder excels at creating a page without you actually having to know how to program, code, and design, but they still have a “one size fits all” feel and may be apt only in the early stages of a business. Moreover, Website builders come with a limited set of design templates or business requirements that do not match yours – now and almost definitely in the future, as your business expands. 1. Choosing the right designer/developer: This is probably one of the most important decisions you will make when it comes to building your professional website. Choosing the right developer entails being clear on your requirements – whether you need a static or a dynamic website, the knowledge you possess about web design budget and responsiveness etc. Complexity: If you are expecting constant updates to your site be sure to pick a developer who is proficient in server-side scripting languages such as PHP, JSP, ASP or Coldfusion. Past Projects & Experience: It’s also imperative to analyze their portfolio, to know if they have worked on a project similar to the one you have envisioned for your website. A professional has experience, training and expertise. With your goals and their understanding of the best suitable platform, you can build a killer website together. Website Requirements: Does the developer you choose have the bandwidth to meet your requirements – especially in case of scaling up. The quality and quantity of resources are ultimately dictated by your project complexity. Cost: The costs may depend on experience of the developer and your requirements from the website. Additional functionalities and capabilities may cost more, particularly if it’s something that wasn’t envisaged originally and requires re-writing of the core code or database. What is the purpose of your website and how much traffic do you expect? What geographies do your customers come from? If you have just begun your journey to your online presence, and are designing your website to be purely informational like a blog or a brochure layout website with not many pages – a shared or a cloud hosting plan may be the perfect options for you. These offer adequate disk space and bandwidth to meet all your needs. Though shared hosting plans have restrictions in terms of software support, resources and root access. If you are building a web application and are expecting reasonably high traffic, a VPS plan could be your best pick. A VPS plan is more economical than a dedicated package, and also highly stable and safer compared to a shared plan. Since all the resources are divided in fixed proportions, you can be assured that the performance of your site will not be affected. If you are building a complex web application or are expecting high traffic volumes to your website, a dedicated hosting plan will guarantee sufficient processing power, control as well as ample disk space & bandwidth. These plans are costly and can be completely managed by you or by the respective web host on your behalf. Keep in mind the distance for data to travel between the server and your audience, when choosing the right location for your servers. The longer the distance, the higher the latency. 3. Choosing the right platform: Be sure to choose the right platform, best suited for your needs – this choice is usually between the two most popular platforms – Windows and Linux! Flexibility: If you wish to integrate ready-to-use solutions on your website, such as blog posts, CMS or forums, you will find a host of open source applications for Linux hosting, easily obtainable on the web. Windows offers several proprietary solutions that are quite popular too. Technology Stacks: Does your website rely on windows specific technologies, like ASP .NET, MSSQL or Microsoft access? If so, taking to a windows package might be a more convenient option for needs. Your designer or developer team’s skill set: Designers and developers choose frameworks, languages and the right platform to run your website on in alignment with their skill sets. While picking the best platform for your needs, it’s also important to consider what your developers are most comfortable working on, to get the best out of your resources. Both Linux and Windows will help you with secure, powerful and reliable hosting services. It’s only in context of your particular website that one could be a better fit than the other. Creating the website is just the beginning of your online profile, you will need to ensure that you take advantage of the visibility, flexibility and boost it can give to your brand. A professional website improves your brand image, blending your brand into the design and functionality of your website. With so much on the line, why not give yourself the best and capitalise on this sure shot way of gaining competitive advantage, credibility and driving traffic. Thanks for reading and I hope this post on how to build a professional website was helpful. If you have any questions please feel free to write to us or post your comments in the section below. Chirag JethwaneyMarketer by day, Maker by night!